Kale is great for decoration, can be prepared as you would spinach and is a great source of dietary fiber. 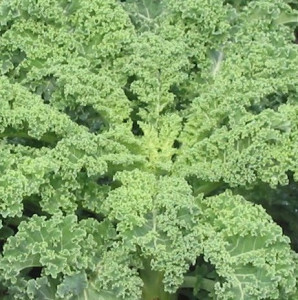 Blanching, steaming and stir-frying are all good cooking methods for kale. It cooks a little slower than spinach. Once called borecole, the word kale was bestowed by the Scots who are the champion kale consumers. Green (Curly) Kale: Curly Kale is probably the most recognizable kale sold in bunches at your local grocery store. Vibrant or dark green in color with tight ruffled leaves and fibrous stalks. Lacinato (aka Dinosaur, Tuscan or Black) Kale: Has hearty dark blue-green tall and narrow leaves with a slightly wrinkled and firm texture. Has a bit more of a delicate taste than the curly kind. Purple Kale: A slightly different leaf that is both serrated and ruffled with hues of deep purple leaves variegated with shades of green. More of a robust cabbage flavor that is more intense than that of green or black kale.